Sofradir EC's TVS-200 EX Handheld Thermal Imaging Camera brings many new features for a compact lightweight imager. The camera supports a variety of applications from R&D to facility maintenance. Sofradir EC's TVS-200 EX Handheld Thermal Imaging Camera brings many new features for a compact lightweight imager. The camera supports a variety of applications from R&D to facility maintenance. 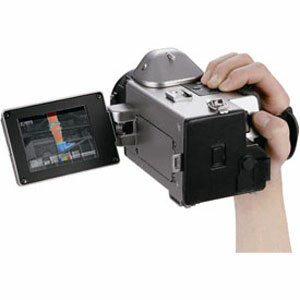 Unique to the TVS-200 EX is a new image fusion function that enables the camera operator to mix thermal and visible video into fused real-time video with control over each channel's strength. The ergonomic, lightweight, waterproof (IP-54 rated) camera body makes it easy to control in the field. Select from a number of in-camera analysis tools including multiple point measurement, temperature alarm set point, area analysis, isotherm and auto hot/cold spot tracking. Measure temperature up to 2000°C or as cold as -20° and record images in both 14-bit and standard JPEG file formats. The TVS-200 EX features a new intelligent auto-scale capability based on four unique auto-scale techniques designed for specific applications. TVS-200 EX produces stunning thermal images at 60Hz with high resolution and high sensitivity. Select from 6 unique color palettes to give you the best colorization for you, and when extra sensitivity is needed simply turn on the advance frame averaging function and improve the camera's sensitivity to better than 0.08°C.